Bold blue dinosaur bone ring in sterling silver created by Hileman Silver Jewelry. 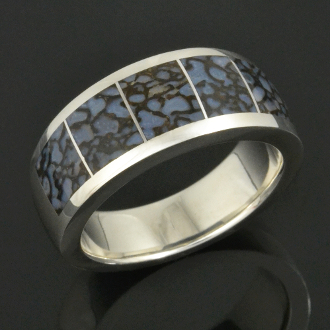 The 5 big inlay sections of dinosaur bone really show off the color and pattern of the bone in this remarkable ring. The dinosaur bone used in this ring is typically referred to as "blue" in dinosaur bone terms but is really more of a grayish blue color. This blue fossilized dinosaur gem bone came from the Morrison Formation in the Colorado Plateau and was a living dinosaur during the Jurassic Period around 144 to 208 million years ago. Only a small percentage of the dinosaur bone found is highly agatized like this bone and blue bone is also very rare. This unique dinosaur bone ring measures about 10mm wide at the top, with a slight taper toward the bottom and is shown in a size 10 1/2 for scale. This ring will be made to order in your specific ring size in 4 to 6 weeks- depending on our work load. This ring style is also a popular choice for a man's wedding ring. This ring is style number M210ssBlueDino. A matching woman's band (or gent's) in several width choices could be made to make a nice dinosaur bone wedding ring set. To order please select your ring size from the drop down size menu. Please add your DUE DATE and your PHONE NUMBER in the "Special Instructions Box" at checkout. Your phone number will be added to the UPS shipping label in case of delivery issues. Most of my rings can be made in stainless steel as well as 14k white or yellow gold for an additional charge. Contact me with your ring size for a price quote. Please take a look at my shop policies and information page before ordering! It is very important that you give us your correct size when ordering as it is difficult to adjust the size without using a laser welder and risking damage to the ring. The paper finger sizers you might find on the internet and print out are not accurate so please do not use them. We have experimented and found that they vary from a 1/4 size to a full size in error. Please visit a local jeweler (or two) and get your finger sized properly. You should use a sizer that is similar in width to the ring you intend to purchase. We depend on you, the customer, to provide us with the correct size so please do not estimate or guess. Special order size rings are NOT RETURNABLE. Mark Hileman produces high quality sterling silver rings, earrings, pendants and bracelets inlaid with turquoise, sugilite, dinosaur bone, Australian opal, gem silica, lapis and other colorful stones. Every piece of jewelry is handmade in Mark's studio in Arizona. The focus is on quality not quantity-using only the best materials and craftsmanship. You will immediately see and feel a difference in the quality. Nice heavy weight silver castings, inlay that is precisely fit with no ugly gaps and a superior polish to show off the stones' natural beauty.